AdaFruit DC and stepper motor HAT with modified Adafruit code. max step rate: 260 - 280 steps per second (again 2 motors means halving the rate). Detailed in this blog post. Again the motors must be run in single step mode. Pololu driver board (available in the UK from here for £7). max step rate with 12 volt supply: 400 steps per second. max step rate with 24 volt supply: 800 steps per second. Using pigpio documented here. This is some very smart software! max step rate with 12 volt supply: 400 steps per second using 1/2 steps (reaches higher speeds in 1/2 step mode than any other mode). Documentation on the stepper motor I am using (PF42-4813G) suggests that with current limiting in place, the supply can be up to 24 volts. With the driver board regulator set to 0.12 volts limiting current to 300mA, the motors now run reliably up to 800 steps per second. With no load they will run close to 1,000 steps per second. With 2 motors running at the same time this is 3,200 pulses per second which the pigpio driver delivers flawlessly on a Pi 2B. The circuit used is is the standard Pololu basic circuit, although I included a small tantulum capacitor as well as the large electrolytic. 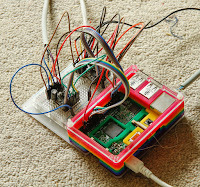 6 inputs to the chip are hooked up to the pi's GPIO pins. 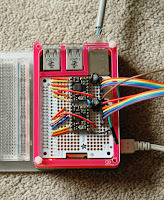 Here is the first lash up on a small breadboard beside the pi 2B that I am testing this all with. A real rat's nest, but it did prove it works and allowed me to do some initial performance tests as well as writing the test software. 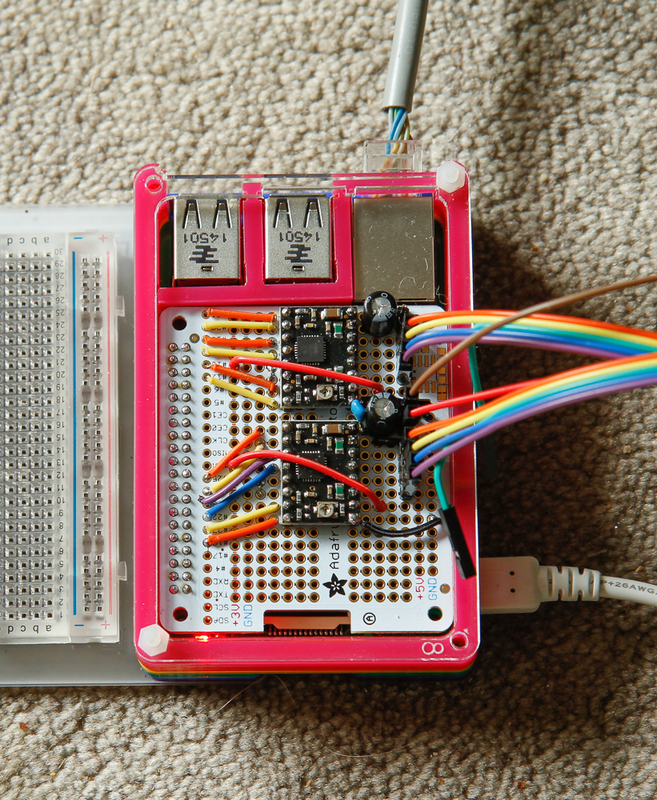 Here is the final version, built on an Adafruit Perma-Proto HAT. This sits snugly on top of the Pi, although I will need to get some proper cooling going before I put this on a pi 3. 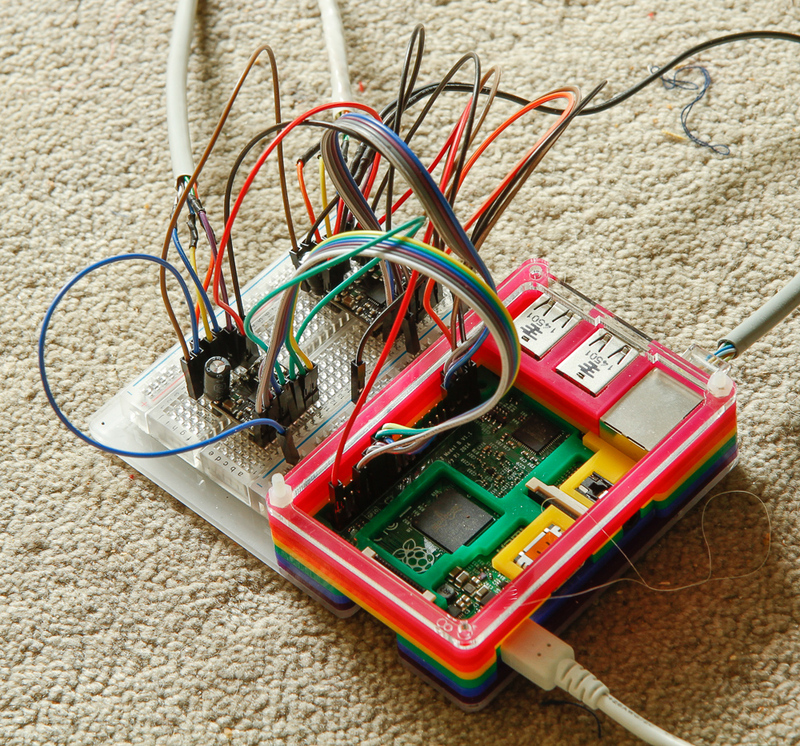 The test program I have written can use either wave chains or a pigpio script to drive the gpio pins. Both work reliably and I have also run them simultaniously.